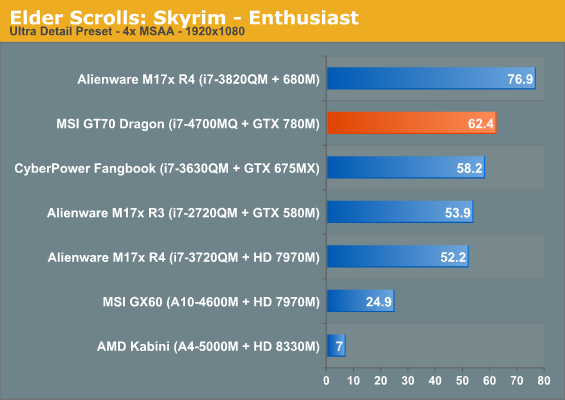 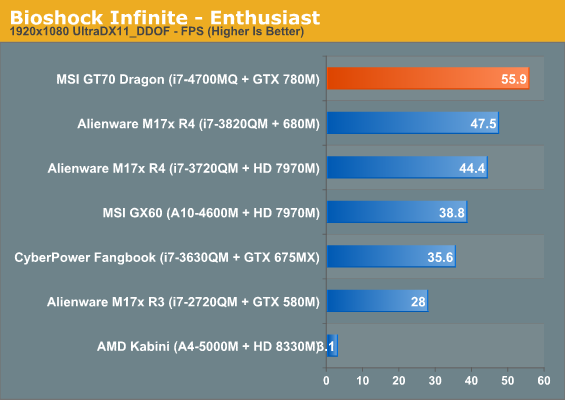 I had been hoping the MSI GT70 Dragon Edition would be an able demonstration of the performance of Intel's Haswell and NVIDIA's GeForce GTX 780M. 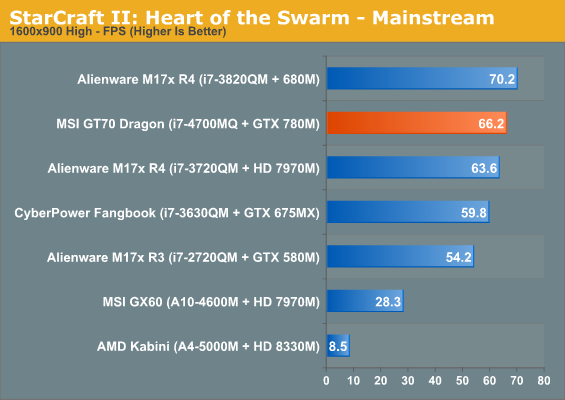 While we can isolate the CPU performance easily enough, isolating GPU performance is much trickier. 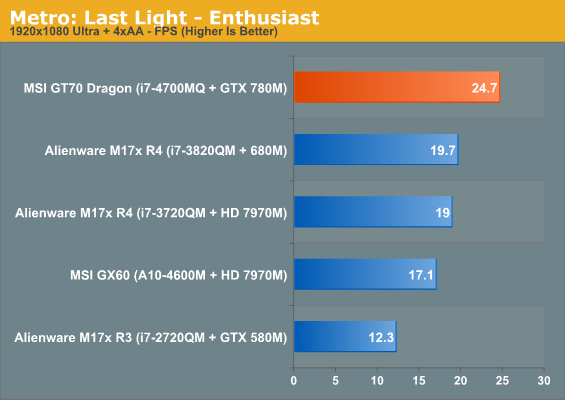 NVIDIA is using boost clocks on the GTX 780M, which means it's able to turbo up depending on thermal and power headroom, and there's actually a healthy enough variation in clocks that different chassis will be able to produce different levels of performance. 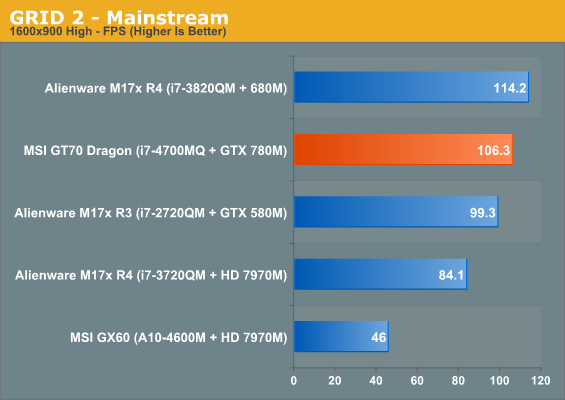 There's also the cooling system of the MSI GT70 Dragon Edition, which either doesn't have or just barely has the capacity to handle a combined 150W of heat. 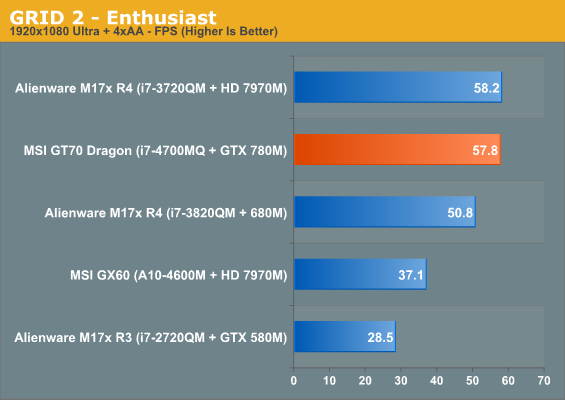 Entry-level gaming results are in Bench, but suffice to say the GTX 780M is more than adequate for those settings, and so for the review I'm going to stick to Mainstream and Enthusiast level benchmarks. 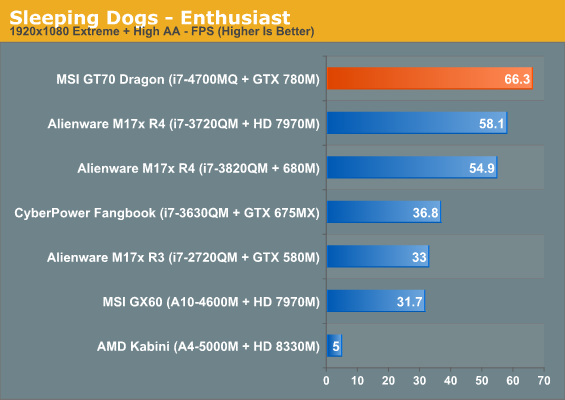 In situations where the CPU is not a limiting factor, the 780M is able to boast a healthy lead on the 680M. But you'll notice that the GT70 Dragon is actually underperforming in certain cases; the CPU is getting throttled due to heat. 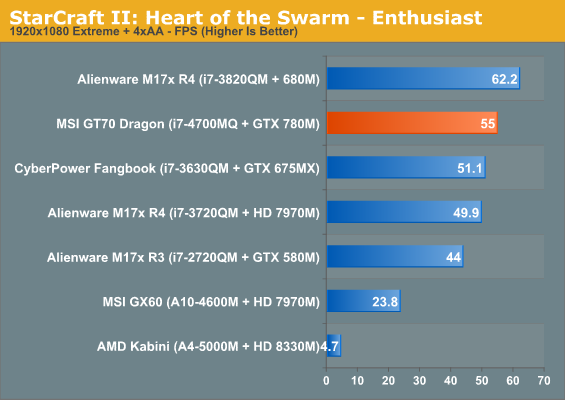 The superior cooling system of the Alienware M17x is able to dissipate far more heat than the GT70's is. 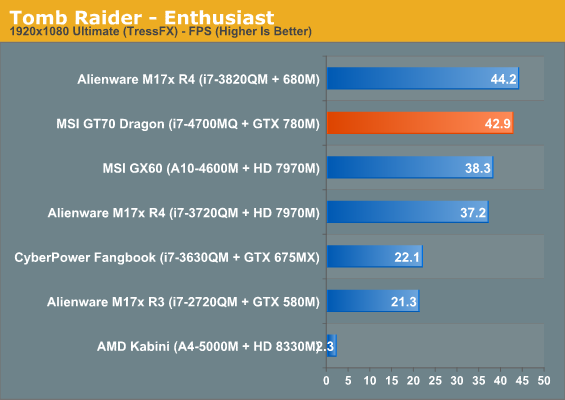 Situations that stress the GPU more exclusively can result in healthy gains over the 680M, but overall stress on the CPU stemming from processor-intensive games like Skyrim and StarCraft II, as well as the hit from TressFX in Tomb Raider, effectively keeps the 780M from really stretching its legs. 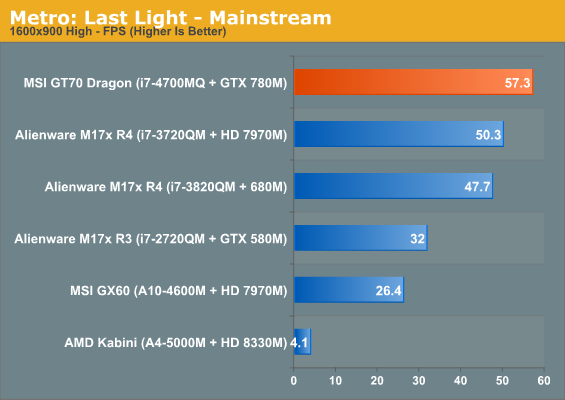 Remember that on paper, at stock clocks, the 780M has at least 22% more shader power than the 680M and 39% more memory bandwidth. 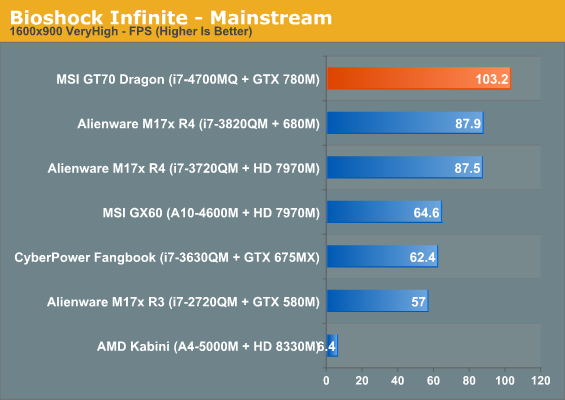 That means that, bare minimum, the 780M should be roughly 15%-20% faster than its predecessor. 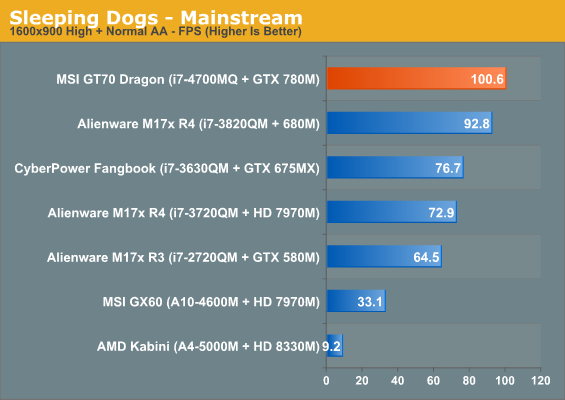 We're getting that in the traditionally GPU intensive Sleeping Dogs and Metro: Last Light, and most of it in BioShock: Infinite. 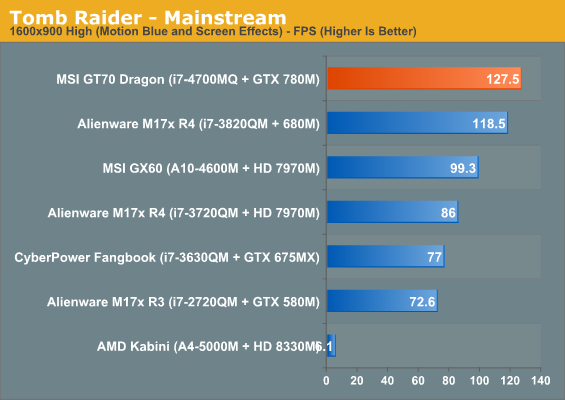 But other games see lower gains, or are even slower on the GT70 Dragon Edition despite it having directly superior hardware.